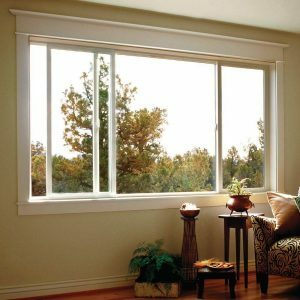 The slider is a design that allows both sashes (sometimes called “vents”) to slide independently, allowing for maximum ventilation. They are often used in openings where the width is greater than the height. Clear Choice Energy Solutions sliders operate with fingertip ease and allow for maximum viewing area. Sliders come in 2-Lite and 3-Lite varieties. In a 2-Lite slider each sash slides. In a 3-Lite slider, both sashes on either end slider, while the center panel is stationary.